They say that if you love something you should set it free. If it comes back to you then it's yours. If it doesn't come back to you: a) it never was yours; or, b) hunt it down and drag it back kicking and screaming. The choice is yours. 231 W. Jefferson Blvd, in lovely Dallas, Texas. The screenings begin at noon on Saturday and wrap up with Sunday's 8:00 pm show. There's lots of cinematic gore in store, brought to you by my blood buddy Andrew Rose and DOA Entertainment. 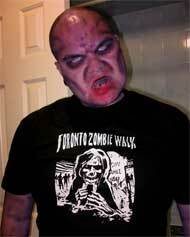 Featured guests include Debbie Rochon, Reggie Bannister, April Burril, and many, many others. Now, I hear you asking, "Is there an Opening Night Party?" You bet your sweet entrails! DOA wouldn't leave you hanging. The Opening Night Party is Friday November 12, starting at 9:00 PM at Muddy Waters Bar, 4314 Live Oak Street, also in lovely Dallas, Texas. Remember: you must fortify yourself for the onslaught of films ahead of you this weekend. And, yes, there's also a Closing Night Party on Sunday after the last show - because you must fortify yourself for the onslaught of Monday ahead of you. AAAAAH!! Details about The Texas Blood Bath 2: Film Festival are available at their website (below). Tell 'em Mighoul sent ya. It won't get you anything, but the puzzled look on Andrew Rose's face will be priceless. I'm a sucker for cool handmade items. Mass-production is all right for heavy duty stuff, like refrigerators. But for other things - those that add beauty, curiosity, and fulfillment to your life - there's nothing like the care and attention to detail of an artisan's touch. And then there's the weird & wonderful. I like when artisans and the weird & wonderful round the same corner and smack into each other. The result is often far more satisfying than a mere chocolate/nut-paste confection. And that leads me to the Bazaar of the Bizarre. 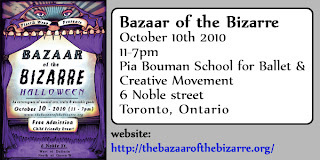 I discovered the Bazaar of the Bizarre last spring on the recommendation of artist David Irvine. It's a Toronto showcase for artisans, created by Plastik Wrap boutique's Adriana Fulop. If you have not attended the last bazaar and do not know what to expect, you are in for a real treat! It is a marketplace filled with amazing vendors. Artists, designers, craft-folk, publishers, and other independent makers of all things exotic, whimsical, and macabre are assembled to attack all of your senses. Sounds like my kind of market place. Last spring we picked up several very cool items, including a pair of skull cuff-links to add some macabre pizazz to a business suit. Then it hit me: I'm an independent maker of macabre stuff. 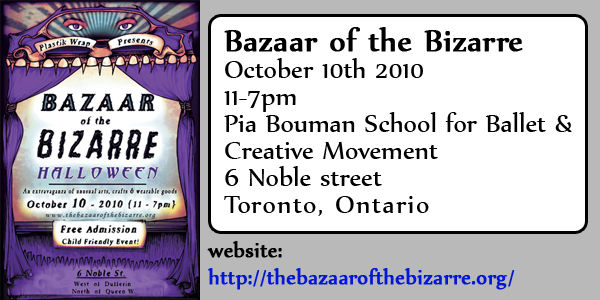 So, we have a booth at the next Bazaar of the Bizarre on Sunday October 10th to add some "AAAAAH!! Indie Horror Hits", Cryptwear, and Black Widow Hearse Club swag to the Bazaar's mix. And to celebrate October we're announcing the DVD release of "AAAAAH!! 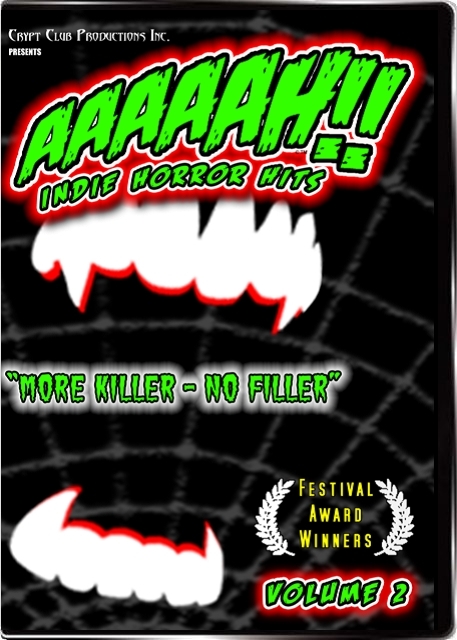 Indie Horror Hits - Volume #2". It's available right now at our web site: http://www.aaaaah-films.com. And, as an added bonus, our checkout is now also PayPal friendly! We're calling volume 2, "More Killer - No Filler". That's right, 'more' because... well, there's more on this disc. We're featuring 9 - count 'em 9 - great short indie horror films on this DVD, for a total running time of 122 minutes - over 2 hours of terror-inducing cinema - plus Extras! So, you'll pardon my high adrenaline level. We premiered advance copies of the DVD at Rue Morgue's Festival of Fear during FanExpo in August. And the response was huge! Folks who bought volume 1 the first time around now snapped up volume 2 sight unseen. Thank you! Your feedback is invaluable!! It's going to be a full month with promo events. 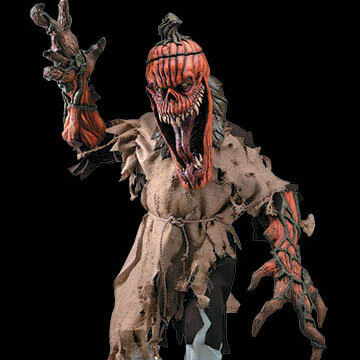 Hope you enjoy all of October as it twists and turns toward a Happy Halloween. Dim the lights and enjoy! If you're into haunting for fun, profit, or even no-for-profit then you owe it to yourself to come and hang out at the Canadian Haunters Convention taking place Friday May 7 to Sunday May 9, 2010 at the Parkway Convention Centre in Saint Catharines, Ontario. So, bring the kiddies. Just be sure you leave with as many as you brought. To celebrate this inaugural event we're taking a ghoulish road trip of sorts. Some of the members of the Black Widow Hearse Club will gather at the Canadian Haunters Convention to showcase a handful of our club's coaches on the trade show floor. Not only can you see these vintage beauties up close, but you'll be able to talk to their drivers. Now that's scary. One of our BWHC founders, Wayne Mallows, is one of the weekend's VIPs. He'll be presenting a practical seminar on "Creating Memorable Characters". 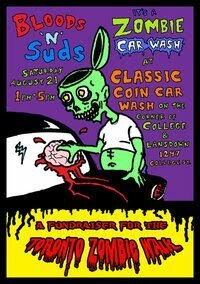 Check the event web site for all the gruesome goings on. 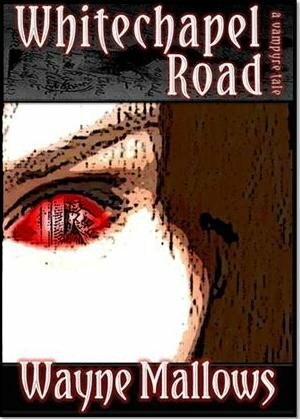 Apart from being rather memorable himself, Wayne has a new novel, "Whitechapel Road - A Vampyre tale", that will be available for purchase and autographing during the weekend at his booth (#203), conveniently located near the Black Widow Hearse Club exhibit. Check the convention website for all the events & times. There's a whole lot of planned for the weekend. The trade show floor is open to the public. The seminars are paid/ticketed events. Scare you there on the trade show floor. And bring the kiddies. Just be sure you... aw, you know. Need a unique Valentine’s Day gift? Perhaps something on the creepy, slimy side of the romance meter? Mom always said she preferred hand-made gifts to store-bought presents. Better yet, why not give each other a Zombie Avatar?! Well, your slurred prayers have been answered. Matt Ficner presents a Creepy Puppet Project WORKSHOP! 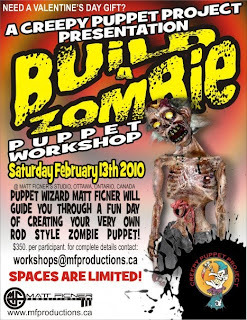 Join in the one-day workshop fun of making your own rod-style zombie puppet. Participants will be given a puppet rod rigged skeleton base to build up gooey bits of flesh and stretch rubbery skin over. Eyeballs, teeth, tattered clothes and other rotten bits will also be provided! It's that time of year again. Time to shake off the new year's cobwebs and turn to face the long, dark nights and wonder, "What's out there?" My close fiend Scott McClelland (Carnival Diablo) has just the thing to focus your other-worldly ponderings: The Paranormal Show is back! 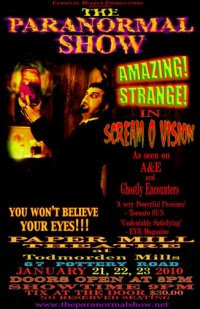 "The Paranormal Show is a Spectacular assortment of Supernatural experiments and a bizarre twist on Sideshow Feats that will make you question everything you thought you understood about REALITY. Take a trip down the rabbit hole and into a world of the Supernatural, a world unlike your own. Witness experiments that will bend and warp reality, giving you a glimpse into a world where science has no place. Loaded with audience participation and laughs galore, this show is a unique experience for everyone. Mind-boggling mysteries abound... you may have paid for an entire seat... but you'll just be using the edge of it during the Show! Join Vladimir Eisengrimm as he attempts to contact the ghosts that haunt Todmorden Mills and unveils Edison's Machine to Talk to the Dead! Don't miss this astounding show!" Thursday January 21st, Friday the 22nd and Saturday the 23rd at The Paper Mill Theatre (Todmorden Mills) in deepest, darkest Toronto, ON. Doors open at 8pm. The show starts at 9pm sharp! Tickets are $30.00, available at the door on the evening of each performance. No Reserved seating, so arrive early to get a good seat! Keep Your Eyes Peeled for AAAAAH!! Shorts on Tonight's "Crash & Burn"
Tonight's episode of "Crash & Burn" (10 pm EST on Showcase), entitled "Lawyers, Guns & Money", is special for so many reasons. This episode re-unites Enrico Colantoni ("Galaxy Quest", "Flashpoint", "Just Shoot Me") with his co-star from "ZOS - Zone of Separation", Michelle Nolden, as a couple with an extreme approach to marriage counseling. Without giving away the episode, let's just say that Enrico's SWAT buddies from "Flashpoint" aren't far away. Nuff said. The series' 8th episode also marks the broadcast licensing debut of not one -- but two -- of the short horror films from "AAAAAH!! Indie Horror Hits, Volume 1". Eagle-eyed indie horror fans will catch glimpses of Christopher Alan Broadstone's "My Skin!" and Anthony Falcon's "The Ninth Entry" as part of a background montage on Enrico's editing console early in the episode. If you like what you see and want more indie horror from indie filmmakers check out the collection at www.aaaaah-films.com - now on sale for $9.95. If you miss tonight's airing check Showcase's show listings for re-broadcasts on Friday and Sunday evenings. Who says Women aren't as scary as Men? Certainly no one that I know. That's fer sure. In fact, I'd say that Women can be a whole lot scarier than Men. If you don't believe me you can check out the following for empirical proof on screen. And in the mean time, have yourself a Happy Grue Year! 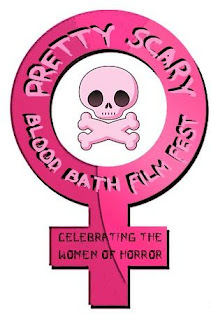 IN HONOR OF WOMEN IN HORROR RECOGNITION MONTH, DOA BLOOD BATH ENTERTAINMENT IN ASSOCIATION WITH PRETTY/SCARY PRESENTS: THE PRETTY SCARY BLOOD BATH FILM FESTIVAL. In response to Hannah Neurotica’s call for the “Women in Horror Recognition Month” in February of 2010, (www.womeninhorror.com) DOA Blood Bath Entertainment will hold The Pretty Scary Blood Bath Film Festival the 27th of February, 2010 from 11 AM to 6 PM at the Studio Movie Grill in Addison, Texas. DOA Blood Bath Entertainment is also proud to announce the sponsorship and support of Heidi Martinuzzi of Pretty/Scary.net (www.pretty-scary.net), the web community of women of horror, by women of horror. The Pretty Scary Blood Bath Film Festival will showcase a selection of independent feature and short horror films that have been written and directed by women. These films are to be selected by Dione and Andrew Rose and announced in January of 2010. Eve Blaack, owner and editor-in-chief of Hacker’s Source, the guide to independent horror, (www.eveblaackpub.com), will serve as the Pretty Scary Blood Bath Film Festival’s Mistress of Ceremonies. Eve Blaack, as a woman in horror, truly appreciates independent horror cinema and has spent countless hours and dollars promoting independent film through the publication of her magazine; The Hacker’s Source. Sponsorship and advertising opportunities are available by contacting Dione or Andrew Rose at info@doabloodbath.com. More information can be found at www.doabloodbath.com. DOA Blood Bath Entertainment is a sole-proprietorship of Dione and Andrew Rose, who seek to provide fans of horror opportunities to view independent horror films through film festivals and special screenings throughout the year. Pretty-Scary.net is the creation of Heidi Martinuzzi, a film and entertainment journalist based in Los Angeles, California. It is the premier web-community dedicated to the promotion and support of women in horror entertainment.